An artist's success can't always be measured in record sales. Sometimes it's the esteem of other musicians that's a mark of success. That's definitely the case with East Coast singer/songwriter Al Tuck. Laurels have been heaped upon him by his fellow musicians as he prepares to release his seventh album, Stranger At the Wake, on May 14th. The album is really built on two pillars. The first is the acapella "There Is a God". Broken into four parts and spread across the record, the song is a moving scratchy-throated hymnal. The second pillar is the title track. Clocking in at almost ten-and-a-half minutes, the chilling "Stranger At the Wake" manages to do what the vast majority of folk song half it's length fail to do: it never wears out its welcome, with Tuck having you hanging on his every word. With those firmly established, Tuck has the freedom to let his musical stylings wander a bit. A romantic starlit lounge vibe comes in on tracks like "Walking By the River", "We Didn't Dance", and the piano jiver "Let It Go (Over Yonder)". A delayed echo-effect on the vocals makes for an intriguing twist on the jazzy "There Is A War". The laid back luau of "Five-O" makes for a bit of an awkward ditty. The same can't be said for the celtic-tinged "That Married Life". Of course, Tuck is a roots musician at heart, so the record wouldn't be complete without some of those touches. "Asylum Square" is a mix of twang and Classic Rock. The piano is busted out for the saloon stomp of "Paid In the Middle of the Night". On "Two Muses Unopposed", Tuck's vocal delivery shares both rasp and gravitas with Leonard Cohen. Tuck has managed a pretty good balance here. He has enough 'safe' numbers to ensure that nobody will freak out over his hit-and-miss (although admirable) dalliances. This is another Al Tuck album that you need to pick up. 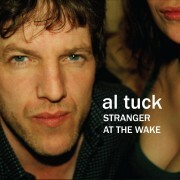 Al Tuck plays the Dakota Tavern in Toronto on May 11th. Best tracks: "Stranger At the Wake", "There Is A War"